Public speaking is assumed to be one of the biggest fears that the humanity has. In case you can't tell, I am a tiny bit skeptical of this notions. There are fears that we have in our genetic code, like fear of falling or snakes. But I highly doubt that fear of public speaking is one that is written in our genes. And if it is not, why is it so prevalent? Since it is not genes, it is most likely the environment. I am sure that most of you were able to enjoy the public speaking when you were younger. I know I had. Even if I am a little glad that most people, except maybe my mother, don't remember the time when I made the whole room of strangers laugh with dirty jokes when I was ten years old. But while some people don't have a good memory of public speaking experience, everybody I talked to about it seems to have some bad or just embarrassing memory of the public speaking experience. My happened in the eight or ninth grade. We had to memorize and present a speech about a person of pour choice. Let me tell you that memorizing that speech was tedious and I still needed help with some words. Something that I have been teased about later. The years passed and I simply accepted that maybe I was just not talented in public speaking. And yes, I am still annoyed at my past self to believe in talent. But eventually I figured out that it was not the lack of talent, but the simple fact that I have been using the wrong method to do it. The memorizing and repetition of speeches have the long tradition in history. The lawyers in the ancient Rome were studying this way. They could not completely butchered the process, considering that the Roman law is still the basis for a lot of our legal system. On the other hand, according to one documentary they also trained their voice by screaming in the middle of the night, so there is that. So I am not trying to say that it is a bad method. Just that it is a method that is not suited for me. This thinking solidified, when I started attending the Toastmasters meetings and among other things we discussed the way that they prepare for their speeches. There was quite a lot of variety. But on the other side, there was also patterns in it. I was trying to find the underlying explanation of it, and I think I found it in the Jung's personality functions, especially the ones that deal with how we get our information. There are two Jung's information functions: Sensing and Intuition. Both of these function can have an Extraverted or an Introverted orientation. 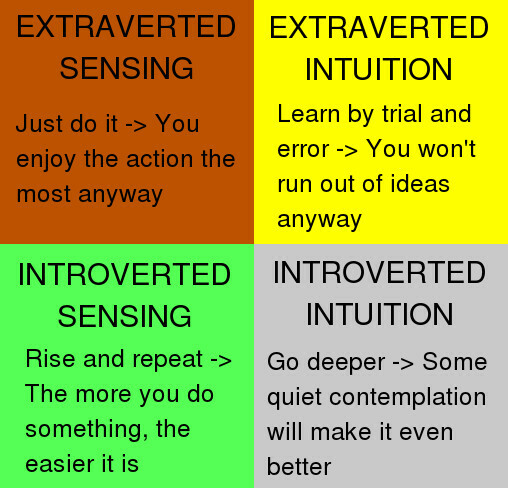 So we end up with Extraverted Sensing (Se), Introverted Sensing (Si), Extraverted Intuition (Ne) and Introverted Intuition (Ni). People with the strongest Extraverted Sensing function then to do best, when they are allowed to try something in practice. For these people, simply putting them on the stage and make them do a speech could be all they need. My sister, who has it as a strongest function hates the whole process of actually coming with the speech. On the other hand, she thrives in the stressful situations (People with strong Extraverted Sensing can enter the flow state in the stressful situation). She even mentioned once, that she is the one person on the debate group that is the best at improvising. People with the strongest Introverted Sensing functions are the ones that feel like at home with the whole write the speech out and repeat it more as many times as necessary. For them, going through the same process as we needed to use in our school could be the best way. Also, these people, the more they do something, the more familiar it becomes to them, and the more at ease they are with it. So doing the same speech in different situations might make they more comfortable. I think that I helped and evaluated a speaker like at Toastmasters meeting once. I remembered that I was surprised that the text that I was sent was the same one that the person used on the stage. Later they commented that they just practiced them the same way the whole time. People with the strongest Extraverted Intuition function are people like me. They are the ones that need the trial-and-error method to do it. For these people, similarly to the extraverted sensing ones, trying it out before ready might be the right approach. But not so much because of the stress, but to get additional data. This is also my strongest information function. I know that after I have all the needed data for the speech, I simply start doing different variations, either in my head or acting them out. I always use the data from the simulation to try something new next time. I am incapable of preforming the same speech in the same way two times. The last but not least are people with the strongest Introverted Intuition function. If I am assuming that they would use the similar method for public speaking than for solving a math problem, then what they need for their preparation is time and quiet. I am not entirely sure what happens in their head at the time, but it seems like some mix of magic and inspiration and the solution pops out. I remember once watching a film that shows a person with introverted intuition solving a math problem. They were staring at the problem and after a couple of minutes, they wrote down the correct solution. I sadly have yet to explore the public speaking process with somebody like that. When you are trying to compare yourself to one of the following descriptions, don't forget to put aside any notion of how the process was supposed to look like, but try to only think about which of these processes come naturally for you. Don't allow the subconscious priming that the environment put on you, if it is not serving you. After all, it is not better for everybody that we are doing the things in an enjoyable way.